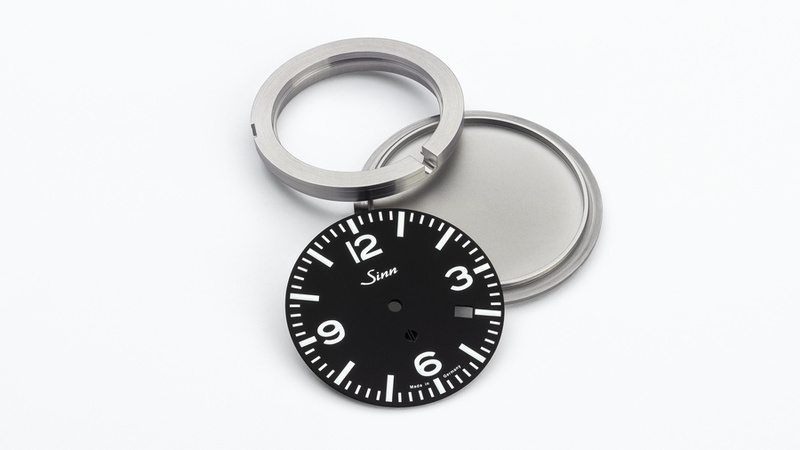 Magentic field protection from Sinn: A soft iron cage, comprising the dial, movement holding ring and intermediate bottom, protects watch's movement up to 80,000 ampere per meter (A/m). This corresponds to 1000 gauss or of 100 millitesla (mT). This Sinn trademark identifies watches featuring magnetic field protection of up to 80,000 A/m. It portrays stylised magnetic field lines and a magnetic core. Magnetic fields such as those of electric motors, loudspeakers or door closers cause the Nivarox balance spring to become magnetized and adversely affect the accuracy of the watch. We solve this problem by using a protective sheath consisting of a closed, magnetically soft inner case that includes the dial, the movement holding ring and the case back. This Magnetic Field Protection minimises magnetic interference. As early as the 1930s, watches used for special purposes were protected against magnetic fields. Later, Magnetic Field Protection was integrated in pilots' watches due to the magnetic deflectors used in the radar screens found in airplane cockpits and ground stations. However, the restriction of Magnetic Field Protection to professionally used chronometers is proving absolute in today's world. While the earth's magnetic field is far too weak to pose any risk, magnetic fields from electric motors, loudspeakers, door closers or other such sources can cause lasting interference with the function of a mechanical watch. Nivarox balance springs are made of a temperature-compensating material which, in certain unfavourable circumstances, becomes magnetised. Irregularities in the rate of the movement are therefore the result of a magnetised balance spring, i.e. a defect in the watch's clock-pulse generator. When it comes to magnetic field sensitivity, the modern balance spring is far superior to the older steel springs with regard to sensitivity to magnetic fields, because Nivarox springs are non-magnetic as required by DIN 8309. However, in the case of a relatively low magnetic field exposure of 4,800 A/m or 6 mT – roughly one quarter of the pole strength of a common house-hold magnet – this permits an accuracy error of ± 30 seconds per day. Compliance with chronometer standards is thus impossible. If the spring is exposed to stronger magnetic fields, the oscillation of the balance will change permanently. Magnetic fields can be diverted using magnetizable materials. If you place a hollow body made of iron in a magnetic field, you will see that a large part of the magnetic flux lines are bundled in the wall of the hollow body. The interior space is thus shielded from magnetic forces to a large extent. SINN engineers use this principle to their advantage. It is important that after exposure to a magnetic field the protective sheath does not remain mag-netized, as it would become a source of interference. Materials that can be easily magnetized but have only low remanence – (residual magnetization after exposure to a magnetic field) are referred to as “magnetically soft”. Pure iron is a good example of this. With the aid of magnetically soft materials, Magnetic Field Protection of up to 80,000 A/m or 100 mT is achieved for our watches in the event of typical everyday unipolar contact. In order to produce this Magnetic Field Protection, we use a closed, magnetically soft case interior that includes the dial, the movement holding ring and the case back. The uncompromising development of professional mission timers (EZM models) – such as pilot's watches designed for use in the cockpit of an aircraft - should always take the special circumstances of that environment into account and closely monitor any gradual changes in the field. For example, aircraft have not been fitted with conventional radar screens for many years now. Sources of magnetic fields which could interfere with the working of a mechanical watch are no longer built into modern cockpits. The Magnetic Field Protection incorporated in some of our models greatly increases the level of protection, offering optimum protection from external magnetic fields on the rate of the movement – of great benefit in daily practice (cf. magnetism to Sinn technology glossary). 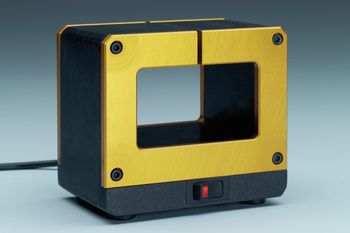 However, the specially designed protective cage used for this emits its own magnetic signature. This is the capacity to change or influence magnetic fields in a characteristic way. Using such a watch in the cockpit of an aircraft means that this characteristic could deflect the aircraft's emergency compass. The priorities of a pilot's watch designed for professional use in the cockpit of a modern aircraft are therefore clear: the EZM-optimised solution should dispense with using a soft-magnetic internal cage and rely instead on amagnetic materials such as titanium. A timepiece which meets these design requirements will not then interfere with magnetic fields itself, yet will still meet the DIN 8309 requirements for antimagnetic watches. In a study of 1000 watches by SINN's customer service department, nearly 60% of the watches received were magnetized, and half of these (30%) had severe defects caused by magnetic fields. During this study, the speed of the movement before and after demagnetization was documented. If the speed deviation before demagnetization was greater than 5% of the speed after demagnetization, a defect due to magnetic fields was assumed. Magnetic field influences were also found even when the wearers weren't aware of any contact with sources of magnetic fields. As a consequence, all watches received by our customer service workshop are first demagnetized using an electromagnet.